Maryland Governor Larry Hogan is the last person environmentalists should be cheering for. Since taking office, Hogan has unilaterally killed Baltimore’s much-needed Red Line light rail and a major mixed-use, transit-oriented development project in the city, while diverting transportation funds to highways and proposing a massive suburban toll road expansion. Under his watch, Baltimore’s sole metro line reached such a state of decrepitude that it had to be closed for a month of emergency repairs. The Maryland League of Conversation Voters is hardly the only environmental group that meekly accepts the climate damage caused by car-centric sprawl while putting all of its “clean transportation” eggs in the electric vehicle basket. In California, local chapters of the Sierra Club are notorious for opposing urban infill housing. Last year, the San Francisco Sierra Club fought a 66-unit apartment building that would replace an “historic” parking garage. The California Sierra Club has come out against SB827, a state bill that would enable the construction of more housing in locations with good transit. While there are legitimate concerns about how the bill may affect housing markets in low-income communities, the Sierra Club simply urged the bill to be withdrawn, instead of proposing amendments. Many national environmental organizations have better track records. The Natural Resources Defense Council, for example, has been instrumental in pushing federal-level transportation policy reforms. The national Sierra Club supports smart growth. Meanwhile, de Blasio’s climate record on local policy leaves a lot to be desired. He’s failed to accelerate bus priority improvements while bus ridership has plummeted. He’s antagonized delivery workers who use e-bikes, handed out tens of thousands of free parking perks to city employees, and declined to support congestion pricing. There’s nothing risky, daring, or envelope-pushing about de Blasio’s sustainable transportation policies. He basically does whatever is politically convenient. The episode says a lot about the limited perspective of many environmental organizations on transportation policy and carbon emissions. The premise underlying much of McKibben’s work is that the climate movement needs to be energized by high-profile campaigns like divestment and stopping pipelines. Those are fights worth waging. But that momentum has to translate into campaigns to stop highways and build places where walking, biking, and transit are the most convenient modes of transportation. Otherwise, we’ll keep on burning carbon in subdivisions filled with large lot homes where driving is the only way to get around. This is a particularly infuriating situation in New York City where the emerging enviro-left has latched on to the factoid that the majority of carbon emissions are caused by buildings, not realizing that is success, because other carbon emissions per capita are relatively low. That’s in spite of the seemingly deliberate attempt to waste as much liquid fuel as possible in pointlessly idling public and private vehicles and superfluous gas generators for mobile streetlights and food vendor carts. I find this infuriating. Especially when people think they’re being climate-conscious by, say, driving a Prius but then support idiocies like bicycle helmet laws. Or people who choose to live out in auto-dependent country and think that it’s the city people who don’t love and care for nature. I have concluded that any “environmentalist” organization with name recognition is merely a form of controlled opposition and greenwash. There is no question whatsoever that environmentalists should be insisting on public transportation, cycling, walking, and railroads. I do believe the corporate media shares responsibility for promoting these organizations and publicizing their non-solutions and non-advocacy. To take a stab at a slightly more charitable interpretation of what’s going on, it seems like a lot of environmentalist groups are dominated by people who cut their teeth in the movement in the 60s or 70s and whose thoughts on this have basically crystallized in that era. Why would this be problematic? Because they’re remembering a time period when dense places were facing really bad smog problems. Of course, they’ve learned all the wrong lessons from that time period, and are ignoring the fact that the problem was catering to cars and not the density, but it’s the only thing I can think of that makes sense for why they still insist on sprawl. That they’re thinking in terms of outdated on-the-ground facts that you could breathe in suburbia but not in major cities. There is no pathway to solving global warming that doesn’t involve cleaning up vehicles by switching them to electricity or hydrogen generated by renewable energy. Even in America’s most car-optional cities there are still tons of cars. None of that negates the need to make things better for people walking, biking and taking transit. There are plenty of arguments for that besides reducing greenhouse gas emissions. It’s not just global warming. Millions of vehicles spewing exhaust in populated areas causes major health and quality of life problems. Even if global warming didn’t exist, there would still be a need to clean up vehicles given how much of our health care spending goes towards diseases caused by air pollution. yeah, I too wonder if this is a matter of the older generation. I see many people who are well meaning but want their sprawl (some might be also tied into the fact that their wealth is very much dependent on their house prices). Time to educate people about how to go about cleaning up the world. I appreciate all of the concerns, we should cut our allies some slack. Highways are extremely popular, and I fear that pushing politicians to oppose them will simply drive away allies and make the movement appear too out of touch or extreme. I agree. Deaths and injuries in crashes, noise and sedentary lifestyles are also problems linked to cars. Bravo for raising this important issue at a very opportune time. However, I think Schmitt should give a bit more credit to the Sierra Club. The S.C. Fix-it-First messaging is quite good, and something the rest of the environmental movement should be building on. See https://vault.sierraclub.org/transportation/fixitfirst/background.aspx They also have successfully pushed for freeway-free (transit & cycling only) transportation initiatives. Many environmental groups have good transportation related materials somewhere in their archives. The problem is that for some reason many groups come up with good hard hitting messaging, and then the next time they update their website some no-nothing (about climate action in the transportation sector) communications nerd or biologist replaces it with drivel. But they still have the good stuff hidden somewhere, and it just has to be updated. What an interesting comment — linking boomers’ retrograde beliefs about urbanism to their personal experience of polluted cities. A keeper! Thanks. It certainly ties in with their beliefs that greater environmental damage occurs from idling cars rather than more cars. Sorry, but congestion pricing in NYC will accomplish nothing because there are no real alternatives — the transit lines are full to capacity during rush hour. De Blasio is right to oppose it. E-bikes are illegal under state law and bicyclists are a menace to pedestrians even unmotorized — I was almost hit by an irresponsible one who had neither light nor helmet just a few nights ago. Transit here is completely under the control of a state agency and De Blasio has little influence. Switching to electric cars will do nothing to reduce air pollution if the electricity continues to be generated from coal. Second, an ever increasing amount of electricity is being generated by renewables. In fact, at this point solar and wind are more than competitive with fossil fuels. Third, even if the first two things weren’t true, switching the pollution generation from car engines to coal power plants has two advantages. One, coal plants are large enough to have much better pollution control than small internal combustion engines. Two, what pollution is left is generated in remote areas where fewer people live, not in major population centers. Electric cars also eliminate another issue with ICEs, namely noise pollution. True. We need to stop using coal, and all fossil fuels. The two policies cannot be separated. I’ve been active in transpo and enviro issues for well over ten years and am attentive to the thesis that many greens and green orgs do a poor job of making connections between transpo impacts and our environment. They do. We do. The accusation is trenchant but not well assembled. I find it helpful to note that the author’s research is almost entirely limited to links to other webpages, many of them from Streetsblog.org. Plus, there’s just one quote. I know easy to be critical from afar, but I hope for better, even if we’re all volunteers. calls or email queries would have uncovered this quickly. I don’t know what’s happening Sierra Club California. I do see that the reference to the their position on SB827 relies only on a letter written by the lobbyist (not senior enough to get the title “lobbyist” but “policy advocate”) I have no way of knowing what degree of formal opposition backing that letter, which is poorly written and hard to understand at points. This reference really should have been vetted with some follow-up. I’ve seen a ton of such letters to legislators. Often times, they’re written in 20 minutes at a coffee shop prior to a face2face. Sierra Club in the Bay Area is definitely a NIMBY organization. No question about it. It’s not an either or, we should promote urbanism and EVs. EVs are necessary to solve climate change unless you can find a way to eliminate the use of private vehicles, and I doubt anyone has a realistic way to do that. Congestion pricing -> Faster bus speeds -> Can “add a bus” without extra drivers. So few people enter Manhattan below 60th street in a car that even if most of those people switched to the subway or bus, it wouldn’t make a significant difference in subway crowding. I’m pretty sure that this point has been made on streetsblog nyc before. Anyways, the subway would have more than enough capacity to meet current demand at all times if open gangway cars were used and if the signaling system was modernized. Also, who are you to claim that e-bikes are a menance to all pedestrians? You’re assuming that everybody agrees with you. Why is it your problem that a random e-bike rider on the street is not wearing a helmet? Far as I know, his or her decision to not wear a helmet only affects him/herself. Boomers and Antiurbanism links on the left and right are well-demonstrated. It’s easier to find a Republican Millennial that is pro-urban oftentimes. Millennials grew up with emergent urbanism (everything is always getting better). We were molded by that experience. Angie’s article is spot-on — especially when it comes to the Sierra Club in Seattle. The Washington State Sierra Club opposes Carbon Taxes. And one of the most outspoken critics of carbon taxes is Robert Cruickshank, who sits on the Seattle Group executive committee. About 25 years ago, the Rocky Mountain Institute did a study about who had the smaller carbon footprint: a careless jerk in a philly rowhouse who leaves the heat on while the window was open, or a conscientious ‘green’ person who lived off the grid somewhere using every bit of ‘green’ technology that was available then. The guy in Philly won without trying. Yes, technology has advanced, but the principles are still correct and valid today. Philly is old fashioned walkable and transit-able urban fabric, while the off grid guy is living in hyper tricked out suburbia; which has been a disaster for our planet. Transportation is a big part of this, but not all of it. The Sierra Club in CA has solidly come out for suburbia forever. And that makes them contempt-worthy. I think people became environmentalists because of a love of nature. If it’s not natural or an approximation of it, they treat it with suspicion. Dense urbanism, like Manhattan with its skyscrapers blotting out the sky and its asphalt and concrete streets covering up the earth, is the epitome of unnatural, and is thus subject to suspicion. I’d call these people “outdoorsmen” or “naturalists” instead of environmentalists. In the age of human-caused climate change, being an environmentalist requires understanding the entire environment and humanity’s place in it. Consider the famous story of John Muir vs Gifford Pinchot and the fight to save Hetch Hechy Valley from damming. The classical environmentalist position is that the O’Shaughnessy Dam is a crime against the earth. But today, the dam produces a ton of electricity and provides the water that makes San Francisco’s density possible. The dam is undeniably a key tool in the fight against climate change. That’s the difference between different generations of environmentalism. Transit Oriented Development is coming regardless of the neighborhood’s opposition. Time will tell. Eventually, the opposition will be replaced with transit minded residents who believe in the power to solve the first and last several miles with TOD. Just a matter of time. Preventing fossil fuel use for heating will be more a war on the poor than anything Trump would ever dream of. Coal plants have NO advantages. The best pollution control technology still leaves it far worse than natural gas. Not to mention the problems with mining it. Bicycle helmet laws are not idiocies. short, bad idea for the org’s mission. As for this year’s effort in Olympia, I read on the CarbonWa website that the Sierra Club has testified in favor of the legislation still alive. And the hydro electric power generated by the Hetch Hetchy water coming downhill powers the City’s electric buses, streetcars and light rail cars. It even energizes the big motors that keep the cables moving for the cable cars. Not true at all. Coal plants produce much less pollution producing the electricity cars need than combustion engines would. Well, your conclusions are wrong. The poorest people in the world bear the brunt of global warming, which is caused by all fossil fuels, including gas. Look at flooding in Bangladesh for example. As a society we can choose to help the poor with their power bills, but it would be immoral to consign all future generations to climate chaos because we were afraid to stand up to fossil fuel interests. People like Trump gut the very programs that help poor people in order to grow the military and cut taxes mainly for the rich and corporations. Helmets save lives, Helmet Laws kill people. They absolutely are. All they do is discourage people from bicycling. Fewer bicyclists on the street makes it less safe for everyone. Safety in numbers. https://twitter.com/NYClimateWorks/status/968520366716084224?s=19 or do you mean something else? I think a romantic naturalism is driving organizations like the Bay Area chapters of the Sierra Club. They just big open green house lots as more natural than closely spaced apartment buildings. They just can’t/won’t get their heads around the fact that dense housing causes less environmental impact. 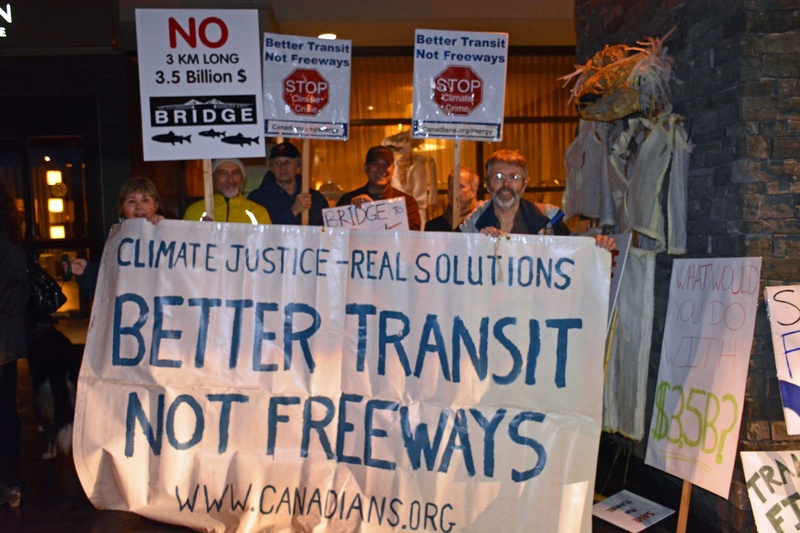 It also facilitates transit, which most of the environmental groups here state their support for. I’m sure their housing positions have alienated a lot of potential supporters, especially young people trying to find housing in this horrible market. The pro-housing work will have to be done by other organizations. A short car trip is better than a long car trip. Even if a policy doesn’t completely take people out of a car, if it controls sprawl in a way that puts housing closer to jobs and services then overall the amount of driving will be lessened. Electric cars are more efficient than Internal Combustion. There would be emissions reductions if you burned gasoline for electricity to power cars. Plus most new generation is coming from natural gas or renewable sources.